I am always impressed by the unique businesses and offerings found in Huron County. N Sew On is no exception. 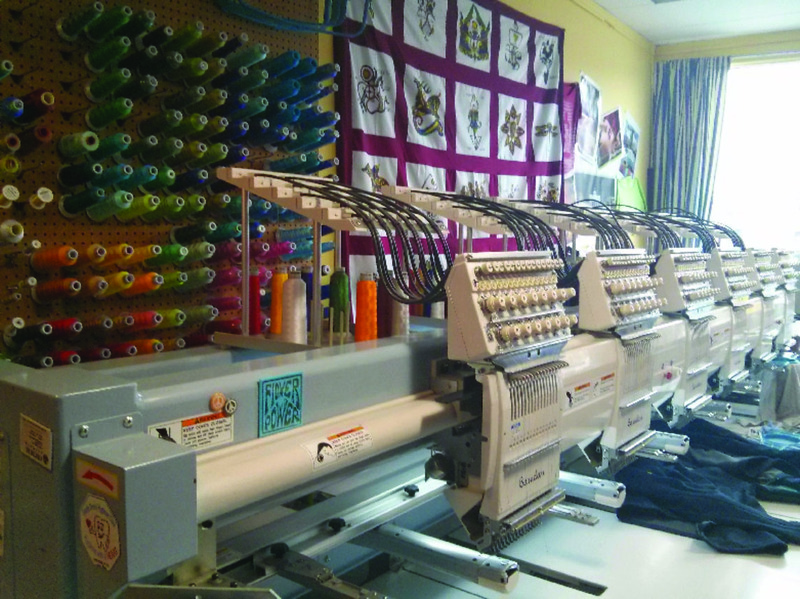 Owned by Kevin Soehner, and located just off of the Square, N Sew On produces custom embroidered items, screen prints, vinyl and custom promotional items. Kevin is very passionate about his work. He gives the impression that no task is too large or small. While I was in the shop, he made a one-of-a-kind screen printed table cloth, hundreds of magnets, had several boxes of orders picked up and set up embroidery machines to make sweaters for a local hockey team. Whenever possible, Kevin makes products in house. Custom blankets, tote bags and aprons are all sewn in Goderich. This allows the client to choose exactly what colour, fabric and dimensions they would like, and then a truly custom product is created. Kevin said that he is starting to become popular with businesses in Toronto and Stratford, who hear about his services when they ask “who made that” of a promotional product. I was amazed with the number of colours throughout the store. Tye-dye and florescent shirts and hats are popular, and bright spools of thread are hung from the wall behind the giant Barudan embroidery machine. Images supplied by clients can be transferred to items in a number of ways. The photo above shows how an image on the screen is transferred by printer directly onto fabric. I got thinking of all sorts of unique gifts and custom items that could be made possible with all of the equipment (and skill) at N’ Sew On. In addition to plenty of bright colours and example pieces, the walls of N’ Sew On are lined with newspaper articles and awards that Kevin has received for his business, including Business of the Year at the Goderich and District Chamber of Commerce’s Spirit of Success Awards. N’ Sew On began as a home based business, and has grown to a large storefront off of the Square. Based on his accommodating attitude, it isn’t hard to understand why! N’ Sew On is located at 53 South Street, Goderich.